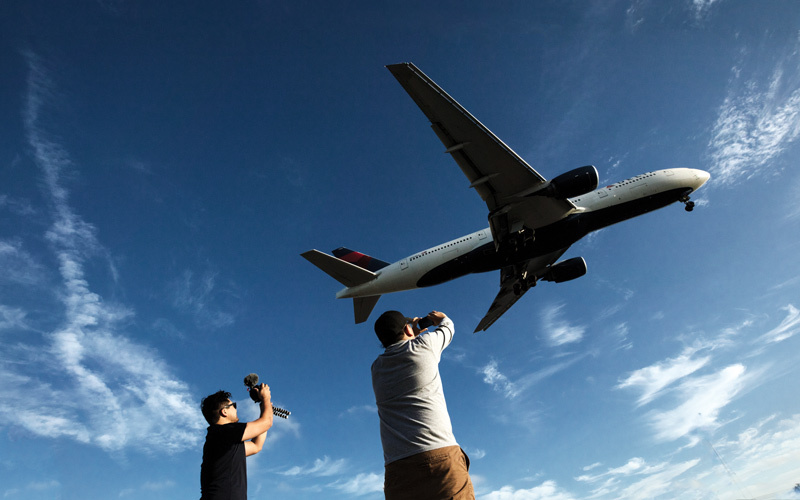 Masuda and the planespotters, as they’re known, frequent a half-dozen places around LAX to ogle aircraft, but their nexus is this one: Called the Hill, the El Segundo park overlooks the south side of America’s second-busiest airport. It’s so well-known, Issac Mohr and Ryan Fesenmeyer, both 16 years old, flew in for the day from Evergreen, Colorado, just to photograph airplanes. “This is incredible,” exclaims Mohr as an Air China cargo plane lumbers skyward. “That’s a 747—sweet,” he adds, before turning his attention again to the FlightRadar 24 app that monitors incoming flights and to LiveATC.net for an audio feed from the control tower. While many planespotters photograph aircraft with special livery, other guys—almost all are male—fancy wide-body jets or luxury private jets. There is a Coke-versus-Pepsi-style division between Boeing and Airbus fans, too. “Give me a break,” cracks Mark Munoz. “The Boeing 757 looks like a flying bowling alley.” Everyone within earshot laughs. Munoz, who says seeing the Emirates A380 covered with Dodgers logos is his present grail, cradles a Canon 7D Mark II with a 70-200 mm lens. He estimates that he’s spent at least $4,000 on equipment. “So far, that is,” he jokes. “I’m not saying I’m done.” Like the Colorado teenagers, Munoz is into apps and special livery; he zipped to El Segundo because he’d been tracking the breast cancer plane and saw it was coming this afternoon.